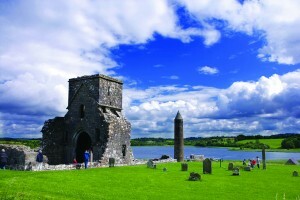 Devenish is an L-Shaped island of 70 acres at the South end of Lower Lough Erne, 1-½ miles downstream from Enniskillen. The monastic site occupies a hill slope at the South East tip of the island. 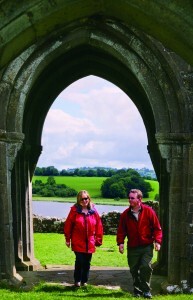 This is one of a chain of Island monasteries in both Upper and Lower Lough Erne. 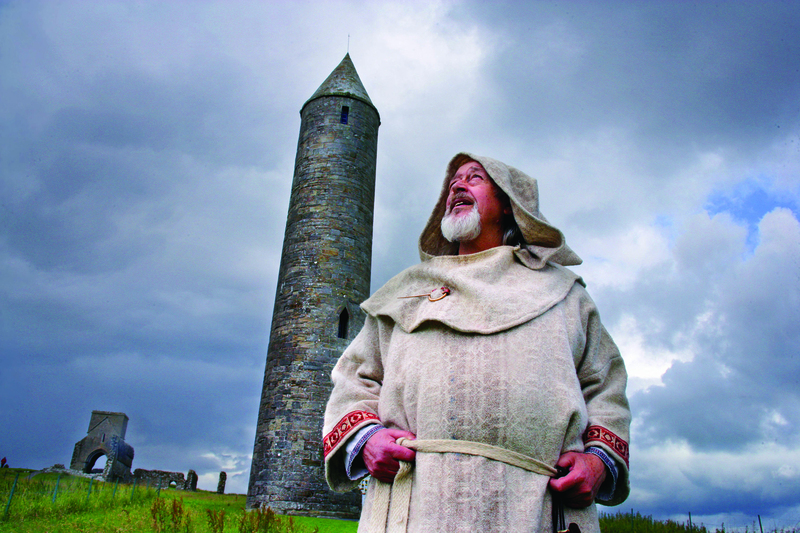 Devenish was an important port of call on one of Early Christian Ireland’s major highways. 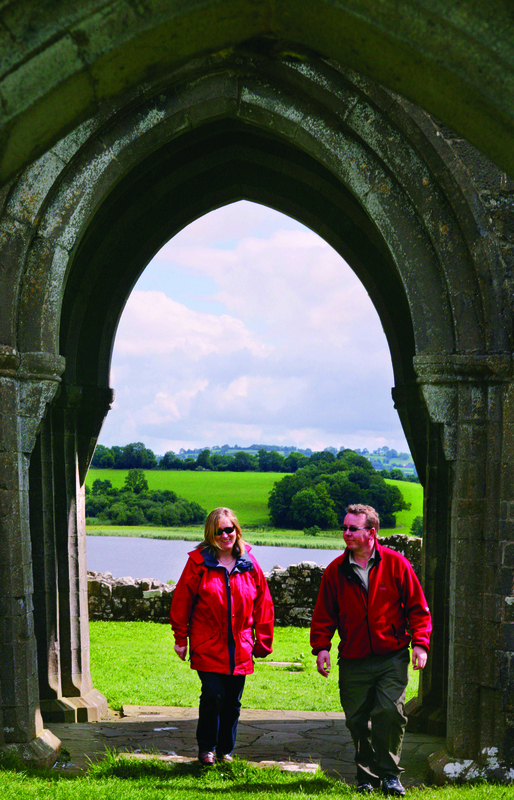 Of course, the best way to discover Devenish Island is aboard one of our regular cruises. 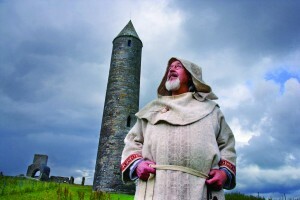 The history of Devenish Island begins not with the very earliest period of Irish Christianity – the 5th Century, in the time of St Patrick and a church governed by bishops – but with the flowering of monasticism in the sixth. The founder, Lasren or Molaise, died in the later sixth century. 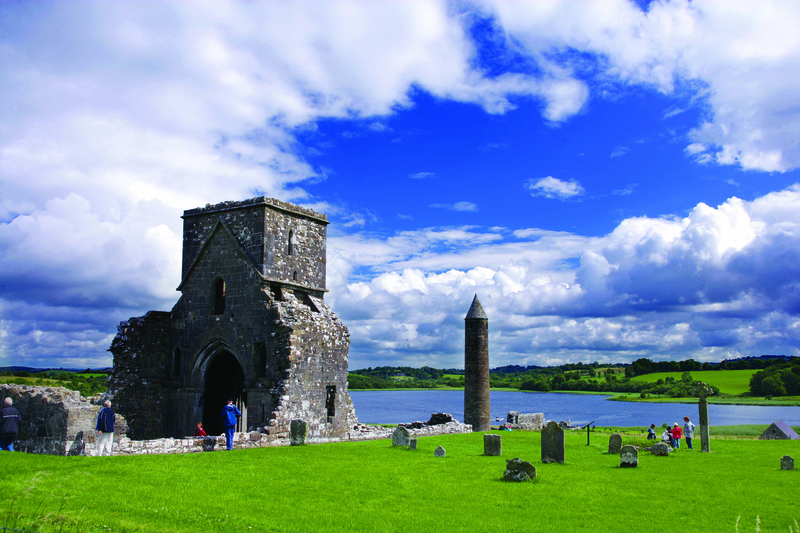 It was one of Ireland’s most important early monasteries, but the Lough Erne sites were vulnerable to Viking waterborne attacks and Devenish was raided in 837. It was also involved in secular affairs and local enmities: its churches were burned in 1157 and a local king’s son was killed by his kinsman in the round tower in 1176. In the twelfth century the Irish monastic church gave way to a new organisation, which centred on bishops, dioceses, parishes and reformed monasteries. On Devenish the old monastic community survived as Secular canons (Culdees), serving the lower church and ministering to the parishioners and St Mary’s, a priory of the Augustinian Canons Regular, may have been founded in the twelfth century. Both communities were dissolved in the late sixteenth century and in 1610 court sessions were held ‘in the ruins of the abbey’ there. Devenish was much favoured for holding parleys and meetings, close to the Ulster-Connacht boundary. But with changes in settlement and communications, the site was less frequented. Parish worship was moved to Monea in the seventeenth century but the Devenish graveyards were used into the nineteenth. The ruins were quarried for stone, easily shipped away by water, but Board of Works did repairs in 1896 and now the NIEA (Northern Ireland Environment Agency) is responsible for continuing conservation and elucidation of the remains. From the jetty climb the slope towards the round tower where the earliest buildings will be found. St Molaise’s house is a very small church badly ruined but of great interest. Certain features look archaic: its small size (internally 19 by 11 feet) and the massive stones facing its thick walls. But the date cannot be earlier than the twelfth century: the decoration of its angle pilaster bases is clearly Romanesque, and it had an elaborate stone roof, each stone cut to simulate overlapping tiles or wooden shingles. Clearly great care was lavished on this tiny building. Could it be a rebuilding in stone of its cherished ancient wooden church, associated with St Molaise or his relics, burned in some miss-hap, perhaps the recorded fire of 1157. The buildings may have reproduced some of the features of the destroyed wooden church in stone, adding decoration in the style of their own time. An observer in 1718 thought this building would stand forever, but it was quarried for ballast, hard-core and building stone and its roof fell early in the nineteenth century. The Round Tower has faired better, repaired in 1835 and 1896 and recently repointed, and remains one of the finest towers in Ireland. Though not as tall and slender as some, it is well proportioned, 81 feet high, with stones carefully dressed to the curve and batter of the walls. The round-headed door, 9 feet above the ground, is of beautifully cut stones with an outlining flat moulding. Inside are five floors above and unlit basement. The modern floors and steps must represent something like the rational arrangements. Each floor is lit by one window except at the top, which has four. At the base of the cap is a decorated cornice with a carved mask above each window, three of men with interlaced beards and moustaches and one beardless, probably a woman. These indicate a twelfth century date for the tower. Round towers were first built at the time of the Viking raids, in the late ninth or tenth centuries, to serve as bell towers for ringing hand bells, but they were also used as safe storage places for books, treasures, and people in troubled times. 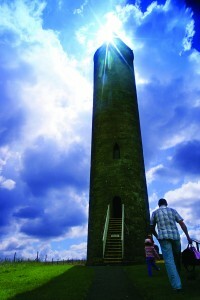 Towers were built long after the Viking menaces passed, as in this case, but the twelfth-century tower may not have been the first on Devenish. Nearby in 1973 a circular foundation was uncovered, clearly the base of another tower, but it was so badly ruined that it was not clear whether it preceded the standing tower or was an abandoned ‘false start’. The Lower Church, the building nearest the jetty, was dedicated to St Molaise. The church is remarkable at first sight for its great length (internally 80 by 18 ft) but it was originally much shorter. The Southern Chapel was added as a mausoleum for the Maguires of Tempo whose arms appear prominently near its entrance in the outer Eastern Wall. The perforated hollowed stone now in the chapel has attracted many stories (the stone on which Molaise crossed the sea, in which pagan priests mixed blood), but it is a two-sided bullaun for the prosaic purpose of grinding food or other materials. The Lower Graveyard contains many fine stones but the oldest (11th or 12th Century) is a long flat slab near the SE. Corner with a two-armed cross. St Mary’s Priory occupies the highest ground, west of the area of the early monastery. Though the Augustinian Canons may have been introduced in the twelfth century the remains are no earlier than the fifteenth. In Augustinian churches the nave was for lay use and the chancel for the canons. The proportions at St Mary’s are interesting: the nave is short compared with the chancel presumably because lay people were well catered for at the Lower Church. The nave was entered by a West door of which the keystone was a beautifully carved female head now in the site museum. The roofline of the nave can be seen on the face of the tower. This prominent tower was added to the original church and its features include a ribbed vault with holes for bell ropes, a stair on the S. leading to the bell chamber, and doors now high above the ground but originally leading to the loft of a wooden roof screen, dividing off the E. part of the church, reserved for the canons. The line of the chancel roof can be seen on the East face of the tower and small quatrefoil spy-hole down to the altar. The main feature of the chancel is the N. door, elaborately decorated with interlace, leaves, birds and clearly fifteenth century in date. North of the church a series of rooms surrounds a small cloister. In the Upper Graveyard stands a most unusual cross, without parallel in Ireland. The interlace and leaves are so similar to the decoration of the Priory’s N. door that a mid fifteenth-century date seems certain. The significance of the square foundation is uncertain but one possibility is that it formed a base for the cross. 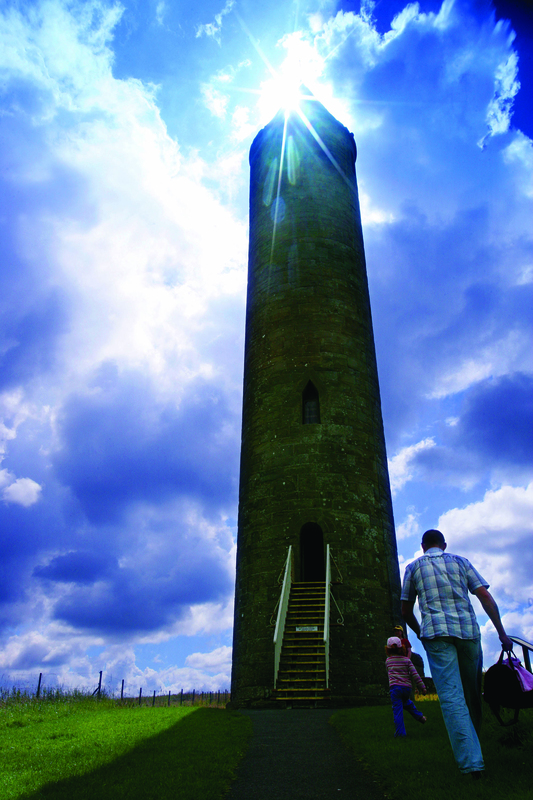 Though full of interest, the standing remains tell only part of Devenish’s long story. For the long period from the late sixth to the mid twelfth century, the visitor has to imagine lost generations of buildings, mostly of wood. Within the enclosure of the early monastery would have been several churches, cells for monks, refectory and kitchen, workshops, stores, farm buildings, gardens, orchards, arable fields and pastures. Of all these there are no clear remains and excavation would be needed to answer them, but there are clues in the extensive earthworks on the hill slopes. Some of the fine collection of carved stones is exhibited in the site museum. The monastery’s principal treasure, the Soiscel Molaise (a book shrine made between 1001 and 1027) is in the National Museum, Dublin. The E. window of St Mary’s was reset in Monea parish church early in the nineteenth century.